It’s Friday, and for the people in Scandinavia, it merely means - time to get on with something sweet. The tradition of eating treats on Friday is a big one here. Most people, between 4 - 84 years old are used to enjoying Haribo candies. I remember being shocked seeing them digging the boxes of candies in supermarkets on Friday afternoon. It's not that I'm playing a food police, it's just something that I haven't been used to see before. Now, please do let me brag (and please try to take something out of it). I’m proud to announce that I won this battle without a single fight with my children. I made sure to educate them on what’s going on with all that candy jazz. Sure they don’t understand the vocational language, but nobody really has to. Food is not to be explained by letters and numbers. It’s about the taste, about how it makes us feel and about what it does for us. We do not need to be scientists to eat as humans should be eating. My boys get a treat on those Fridays when they ask for it. We do not make it available unless they want it. The only condition my husband and I have is that it needs to be the best quality we can find. I don’t care if it’s a chocolate, brownie, fruit or a smoothie. It shouldn’t be boxed in a vivid package with dozens of additives and processed stuff. They either get something from our favorite places or I home make it for them. Do we have exceptions - we do. If we are visiting someone who offers the mainstream treats - boys have the opportunity to decide whether they are taking it or not. Afterwards, we talk about it, and they learn how different foods make them feel. I do not stress about this as the majority of their diet is just right. As someone once said, I don't care what you eat between Christmas and New Year, but I do care what you eat during the rest of the year. Now, I made a treat for the family today, and I hope you’ll be interested to follow through. I might not be very good with adjectives, but with this one, it just went spontaneously. It's a mouth-watering, body-shaking and gut-loving treat. It’s how I imagine the taste of heaven. It's the 2-minute dessert that you can "dress up” with a few stylish things - a nice cup of quality tea, a beautiful candle, soft light and some dinnertime music in case you're making it for yourself or your friends. Take a small bite at a time and transcend yourself to the different galaxy. And not to forget, find the best quality ingredients, because that will set the tone for a great or the average taste. Make a lengthwise cut in each date and remove the stone. Stuff each date with 1 tsp of tahini and sprinkle with 1/2 tsp cinnamon. Gently squeeze to close, then place the walnut half on the top. Serve nicely with some cool mint or licorice tea and enjoy e-v-e-r-y bite! If you're familiar with stuffing the dates, you could notice that I use tahini (sesame seeds paste) instead of peanut butter. Tahini is much more nutritious and safe than peanut butter which is moldy and full of aflatoxins — very dangerous for the brain health and detrimental to the mitochondria in the cells. Whenever you can, swap it for something more appealing such as tahini, cashew butter, almond butter or my absolute fav - macadamia butter. 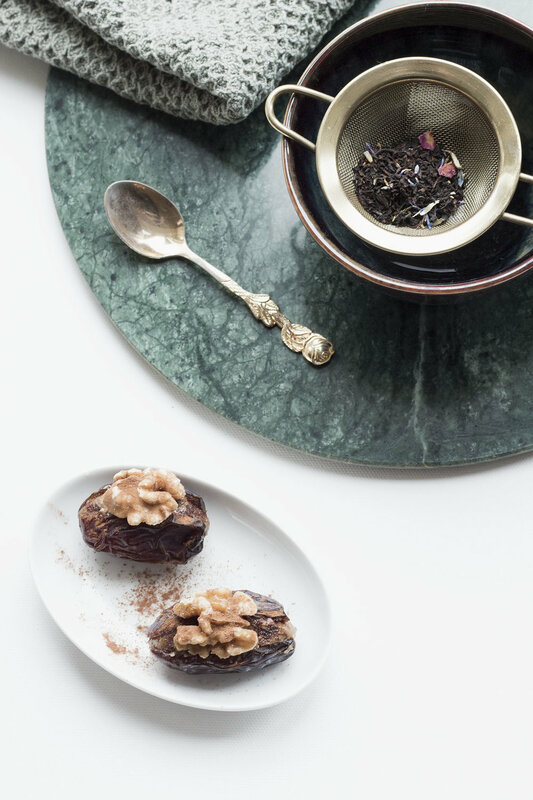 Medjool dates are high in fiber and loaded with many vitamins and minerals. They can help you with different things, and I’d like to underline the very quickly notable ones: aiding constipation and boosting energy levels. However, make sure not to overeat them, as they also contain sugar. To avoid blood sugar spikes on a daily basis, which lead to weight gain and type 2 diabetes, always take your fruit, or another source of carbohydrates with a source of fat or protein (hemp seeds, nut/seed butter, almonds…). Fat and protein help to even the release of the glucose into your bloodstream. Stay with me to learn what this means for you. If you decide to eat Medjool dates or any other fruit or carbohydrate without any fat or protein, your blood sugar levels will spike significantly. Then, insulin will be released to bring the glucose (that blood sugar) to the cells. The higher the glucose in the blood, the more insulin will be released into your bloodstream. If you do this regularly, you’ll likely develop insulin resistance at some point. Let me not get into brain-related stuff. When insulin takes the blood sugar away from the bloodstream, you’ll feel hungry again. Your brain will signal that you need to eat. Again. I suggest that you use a few nuts or seeds as a complementary ingredient that will help regulate blood sugar without causing notorious spikes. By adopting this as a part of your routine, your brain won’t ask for more food shortly after you've eaten. Have fun, be creative and let me know how it went over on my social media.